Waterproof is rated 3.5 out of 5 by 4. Print waterproof labels for beverages and all liquid containers. Large and small order quantities available. Rated 5 out of 5 by Aguilar27 from Great Print Quality and Material I am very pleased with the quality of the labels! They will stand out and look nice on our HVAC units. Rated 4 out of 5 by BILAAL from Great service The label printing was great and delivery was fast! Rated 4 out of 5 by David34102 from Great Label - Awkward Backing Great printing, great label material, but the backing is awkward to remove to get to the sticky side. If you need labels on items that require moisture-protection and durability, our waterproof labels will fit the bill. Our custom waterproof labels printing is done on vinyl or BOPP material in a your choice of color and texture, and are built to withstand the rigors of immersion in water or high humidity. Print them cut-to-size in sizes from 2" x 2" to 12" x 18", or in rolls sized 0.5" x 1.5" to 10" x 5". Cut-to-size shapes include squares, rectangles, circles , and ovals with optional rounded corners for the squares and rectangles. 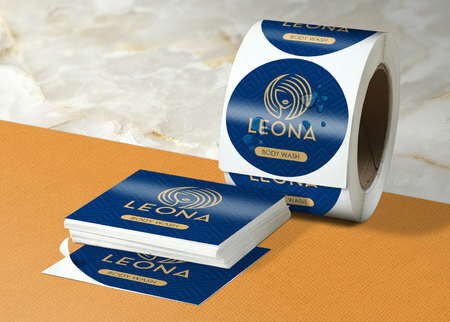 Rolled waterproof stickers come in rounded corner squares and rectangles, as well as ovals and circles. Same Day Turnaround: Cut-to-size waterproof labels can be printed the same day you order them. Roll labels can be ready to ship in two business days. Our layout templates ensure that your waterproof labels meet our printing guidelines with bleed lines. You can download the right layout template in an EPS, PDF, or JPG format. In addition to a description of the contents of a container, labels should give an idea of what your brand is or what you want it to be. Waterproof labels can last longer than their plain paper counterparts, standing up better to sweat, refrigeration, and liquid contents. This makes them an excellent choice for labels that keep spreading your brand, regardless of whether or not you’re expecting them to be immersed. Waterproof labels are obviously the best choice for containers that will be exposed to moisture. But the attractive texture of vinyl and BOPP stocks can also improve your brand perception, making it a good choice in most situations to print waterproof labels. Clear BOPP for instance can also be used to show off the contents of any transparent container, while vinyl is a durable material to use for any labeling need.